With the Bronx 10-Mile plus eight additional training miles scheduled for this Sunday, I am taking today and tomorrow off from running. I’ll hit the gym for upper body and core workouts, and maybe run an easy two miles tomorrow morning, but otherwise I will be spending time off my feet. Previous Bronx 10-Mile start. Reposted from nyrr.org. 1) Know Your Race Pace: I’ve overcomplicated this question, and here’s why: Because I’m running the NYC Marathon in five weeks, I don’t want to hurt myself or ruin my strong training base by going too hard during this run. However, I have only raced once since March (at the Percy Sutton 5k), and am pumped to be racing again. I also plan to run an additional eight miles for marathon training after the race, so running the race hard—at a pace faster than my anticipated marathon pace—will likely lead to muscle soreness and extended recovery. But! I want to see how my right hip has healed post-injury, and a hard run will provide some insights. Also, racing is fun! So, the answer to the question is not that difficult: If I choose to race the Bronx 10 Mile, I will try to hit a 6:15/6:20 minutes per mile pace; if I choose to tempo run the race, I will hit a 6:35-6:45 minutes per mile pace. Which option I choose will likely be a game-time decision. As for overall race pacing: I plan to start out slightly slower than goal pace, adjusting for downhills and uphills, and pick up steam throughout the race until I’m pushing well past goal pace for the final 2.5-3 miles. During that final push I will focus on passing other runners and maintaining my position. 2) Know Your Course: The Bronx 10-Mile course is an out-and-back on the Grand Concourse, with two additional out-and-backs between miles 4 and 7 (Bronx 10-Mile Course Map). With eight aid stations (at miles 1, 2, 3, 5, 6ish, 7, 8, and 9), there will be plenty of water. Since NYRR did not publish an elevation map, I created my own (rough estimate) using MapMyRun. Outside of a mild uphill between miles one and three, and again around mile 6.1, the course is fairly flat, and features a generally downhill final three miles. Not 100% percent perfect, but a rough estimate of the Bronx 10-Mile elevation profile. Thus, besides the limited uphill portions, this is a “let ‘er rip” kinda course. As long as you recognize that you will run miles one through three and mile seven slightly slower than goal pace, you can post a solid time by maintaining your pace on the flats and exceeding it on the downhills. 3) Be Willing to Adjust: Because my knowledge of the course came from a self-created elevation map and other runners’ recaps of past Bronx 10-Miles, I might be missing something. Therefore, I am willing to accept that I could encounter additional uphills or wind resistance or other factors that make the race more difficult than anticipated. And that’s OK. The only expectation I have for myself is to finish and to have fun. 4) Nutrition: I wrote briefly in a previous post about my interest in learning more about the low-carb high-fat diets that many ultra endurance athletes favor. While I might embrace that method in the future, for now I’m sticking with what I know: carbo-loading two-three days before the race, and either a gel or a pinole/chia snack about 4-5 miles into the race. That’s about it. I will spend the next day or two overthinking whether I want to race or train this run, but in all likelihood, I’m going for it. I’ll be heading up to the race with my sister and my friend, Mike. 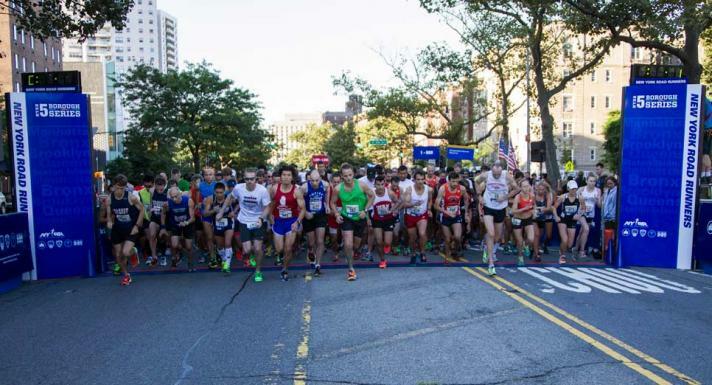 Are you running the Bronx 10 Mile? If so, good luck and say hello!